Christopher Bates Launch at Holt Renfrew Vancouver! All images courtesy of Kuna Photography, unless otherwise noted. Christopher Bates.................I don't even know where to start begin. I was very privileged to interview this talented designer twice early in his career. He was still living in Vancouver at the time. It was amazing to have a luxury menswear designer to include in the local magazine I co-owned (folded in 2012). He was almost the only one at the time. When he left for Toronto to take his label to the next level I was of two minds - excited for him as it was truly the perfect choice and sad for the loss to Vancouver's talent. Now here we are several years later with a triumphant return to Vancouver to launch his label in Canada's foremost luxury store - Holt Renfrew. His journey to this moment was destiny. When Bates was chosen in 2013 as winner of the Merecedes-Benz StartUp Program, Barbara Atkin – Vice President of Fashion Direction for Holt Renfrew – became one of his mentors. “She helped me meet the right buyers and get my foot in the door. It was the biggest breakthrough of my career so far and I'm eternally grateful for her support.” There was no way I would miss this event and a chance to reconnect. In my mind, Christopher Bates and Holt Renfrew are a perfect match. Holt Renfrew's clientele understands, recognizes and embraces quality, elegance and style. As you go up the fashion scale toward couture, you see a definite trend towards a lessening of tricks and while the aesthetic still makes a strong, personal statement - it is achieved in a subtler way. Bates' line is well-edited, created from only the finest fabrics and features first-rate tailoring/construction. Less is more. Every detail, every seam, every fabric, every silhouette is well thought out to give full impact - classic, simple and statement making. His one pop that puts a smile on my face is a bright red kiss print on the collar of the classic white dress shirt. For the launch, the store chose to break it into 2 sections. 2-4 was set aside for media interviews. Bates moved with grace from one interviewer to the next - always patient and generous - without a single break. Interviews included The Vancouver Sun, freelance writer Steven Schelling (Nuvo, Montecristo, etc. ), Amy Yew ( Vancouver Courier, The Social Life), Jenica Chuahiock (Tattles, Tales & Things), Angela Krewenchuk (Retail Insider ), Edward Quan (Styledrama) and more. An amazing waiter moved through those waiting offering a refreshing mixed fruit beverage in tall slender glasses. After only a short one hour break, Bates was back at it from 5-7 at the open launch and he was just as at ease and welcoming as in the first half. The group quickly quadrupled in size and was full of fashion industry professionals, media, family friends and admirers. It was a non-stop frenzy of people wanting that chance to say hello to one of Vancouver's own talents and photo ops galore. My favourite attendees were a group of his mother's friends that were situated around the couch areas and literally bursting with pride. Their smiles and joy was infectious. Congrats to Christopher Bates on all he has accomplished in such a short time. Kudos to Holt Renfrew on yet another first rate launch in their beautiful DT Vancouver location. Looking into my crystal ball, I see Europe beckoning and soon. Christopher - I hope you remember all of us as your star soars and when you launch in Europe I hope to be front and centre cheering you on. For more information or to view the Spring/Summer 14 collection now available, go to www.christopherbates.com. In Vancouver, you'll find the Christopher Bates collection in Holt Renfrew at 737 Dunsmuir Street. You can follow him on Facebook HERE and on twitter at @CBatesMenswear. Want to take a trip down memory lane? You can read my 2 previous articles at Retrospective on Christopher Bates - 2009 and 2010. And look for a new article out out at the end of April 2014 in Raine Magazine (NYC). 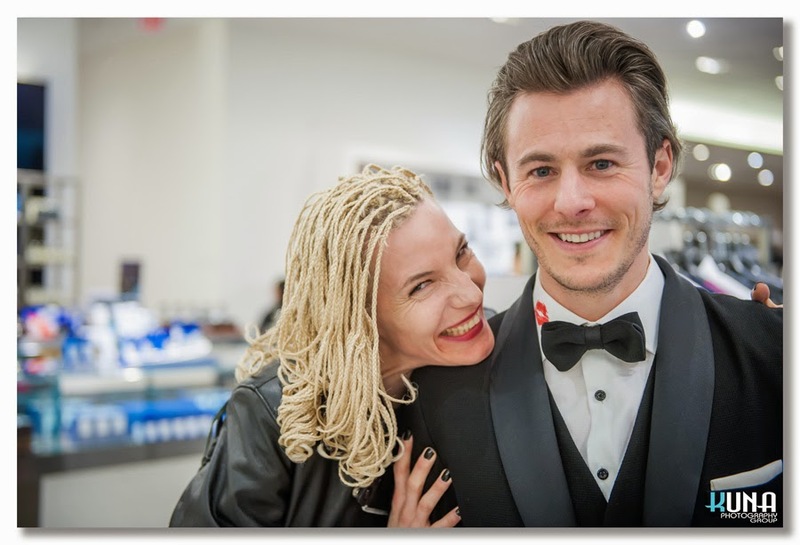 PS - Just have to share this great pic taken by Kuna between the 2 segments of us showing off our style outside the Holt Renfrew Project H shop. 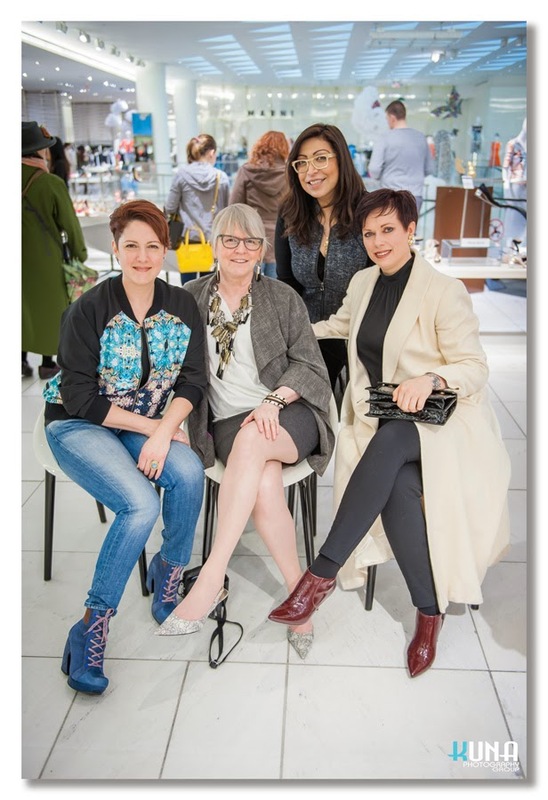 Left to right are - Tricia Romani (Wilhelmina Vancouver), myself (Raine Magazine), Dona ? (Style by Dona) and Helen Siwak (Kitsilano Kitty's Closet and Vit Vit Vegan Food Service).